Above: Mao Zijun stars as Iron Fist in “The Four”. Mainland Chinese drama, The Four <少年四大名捕>, began filming at Hengdian World Studios on February 27. Because of the enormous expense spent on bringing together the best production team in the country, there has been much speculation over who “The Four” will be. Recently, the male leads were revealed to be Hans Zhang (張翰), William Chan (陳偉霆), Yang Yang (楊洋), and Mao Zijun (茅子俊). Based on the wuxia series by Wen Ruian (温瑞安), The Four is the story of four young men – Cold Blood, Chaser, Heartless, and Iron Fist – who each excel in different martial arts practices and use their expertise to bring down corruption and establish justice. 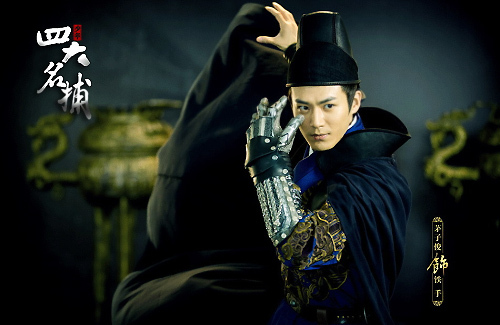 The story has been adapted many times for television, including the 2008 TVB drama starring Raymond Lam (林峰), Kenneth Ma (馬國明), Sammul Chan (陳鍵鋒), and Ron Ng (吳卓羲), but the previous versions achieved only minor success. 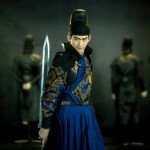 In an attempt to put a fresh spin on this new adaptation, the producers decided to combine the martial arts story with fantasy elements. 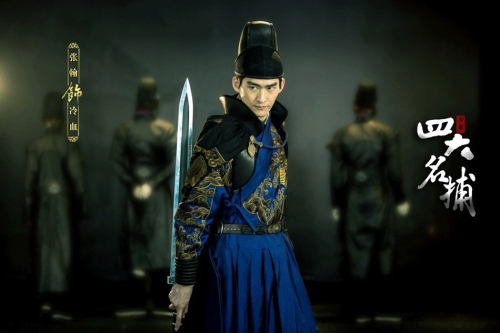 This mixture of genres has seen growing popularity in past years, especially with dramas adapted from role-playing games, such as Chinese Paladin <仙劍奇俠傳> and Xuan Yuan Sword 3: Scar in the Sky <軒轅劍之天之痕>. The Four will be co-directed by Liang Shengquan (梁勝權) and Chun Man Wong (黃俊文), both of whom are familiar with this genre, having worked together on Xuan Yuan Sword 3. This new adaptation of The Four also pushed for a more youthful cast, imbuing an “idol” element alongside the fantasy and martial arts. According to an online poll posted on the drama’s official Sina Weibo, mainland Chinese actors Hans Zhang, Lin Gengxin (林更新), and Mickey He (何晟銘) were the favorites among netizens. The production side, however, has mostly kept quiet about the main cast, although an insider revealed that Mickey would be one of the villains. 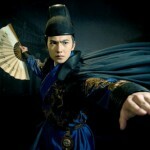 Recently, promotional stills of The Four were released, showing Hans Zhang as Cold Blood, William Chan as Chaser, Yang Yang as Heartless, and Mao Zijun as Iron Fist. Although all four actors are relatively young, their experience in the entertainment industry is undeniable: Hans Zhang was the male lead in the mainland Chinese adaptation of Meteor Garden <流星花園>, William Chan is a popular Hong Kong singer and film actor, Yang Yang was the lead in the 2010 drama adaptation of The Dream of Red Mansions <紅樓夢>, and Mao Zijun played the role of “Fourteenth prince” in Palace <宫>. The lead female actress has not yet been announced, but the handsome features and combined star power of “The Four” are sure to draw all eyes to this new adaptation. Where have all the original scripts gone? Looks like the mainland industry is still ransacking internet novels and making endless adaptations of anything and everything under the sun. Oh well. At least we get to look at Mao Zijun and Yang Yang. By the way can you inform me if there is or why there was not a Remake of the TV series Mythical Crane Magic Needle would be appreciated. I wonder who will be who. I only know William Chan among the 4 leads. Ok, saw the last paragraph. Know who plays who liao. Hope the mustache of Zhuge duke won’t be knitted. Is fantasy really a popular trend? 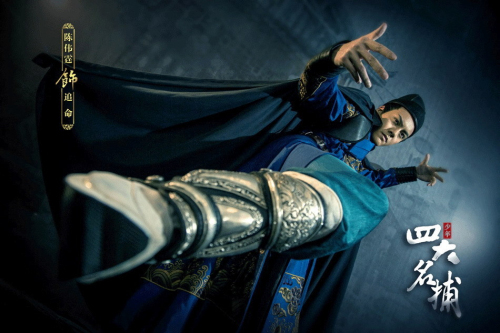 Because I miss good old fashioned wuxia style fighting that’s not 98% CGI effects! I can only imagine if they add the fantasy element, it will end up being 100% CGI. The cast looks absolutely B-list but if it has a good script, it could make them all really popular. And is there really only one lead actress? The TVB version had a love interest for each guy. The only name that rings a bell is that twin’s b/f…the rest looks cute too i guess but no clue who they are. I don’t know why, but I never get tired of this series being remade over and over.It’s nice to see righteous government agents for a change. 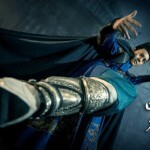 Even though the recent movie was kind of cruddy (Wu Xiu Bo was awesome as a villian though!) I still enjoyed it a bit. Glad to see them moving back to the traditional 4 male roles; I didn’t dig the female heartless at all! I don’t recognize any of the male leads in this but still will be looking forward to it. Do you happen to know what the movie was called with the female Heartless? Finally can see the pictures of each chac. 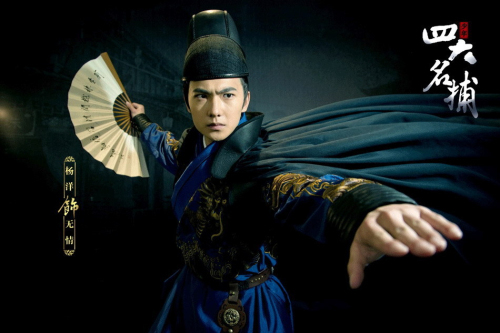 These outfits reminds me of Chen Kun in Flying Swords of The Dragon Gate. In other words, it’s like the battle of the eunuchs in these outfits.